Sailor Jentle Doyou is from the 2010 Sailor Jentle Four Seasons collection. It's technical full name is Sailor Jentle Four Seasons Doyou Midsummer Dark Brown, but holy cow say that five times fast. Doyou is a very dark brown, bordering on black. This ink is supposed to be a summer brown, but it says fall to me more than summer. I don't really think of dark browns when I think of summer colors, but maybe that's just me. In large swabs, this ink really does look more black than brown. It does have a lovely sheen though. Let's take a look at the ink on good paper first: Rhodia, Tomoe River, and Leuchtturm. Water resistance: Medium-some of the ink washed away, and it smudged, but you would still be able to make out what was written. On Moleskine paper, which isn't really fountain pen friendly, the ink bled quite a bit. There wasn't really any feathering, just bleeding. Ink swabs for comparison, left to right (top to bottom for RSS): Diamine Cult Pens Deep Dark Brown, Sailor Jentle Doyou, and Diamine Macassar. 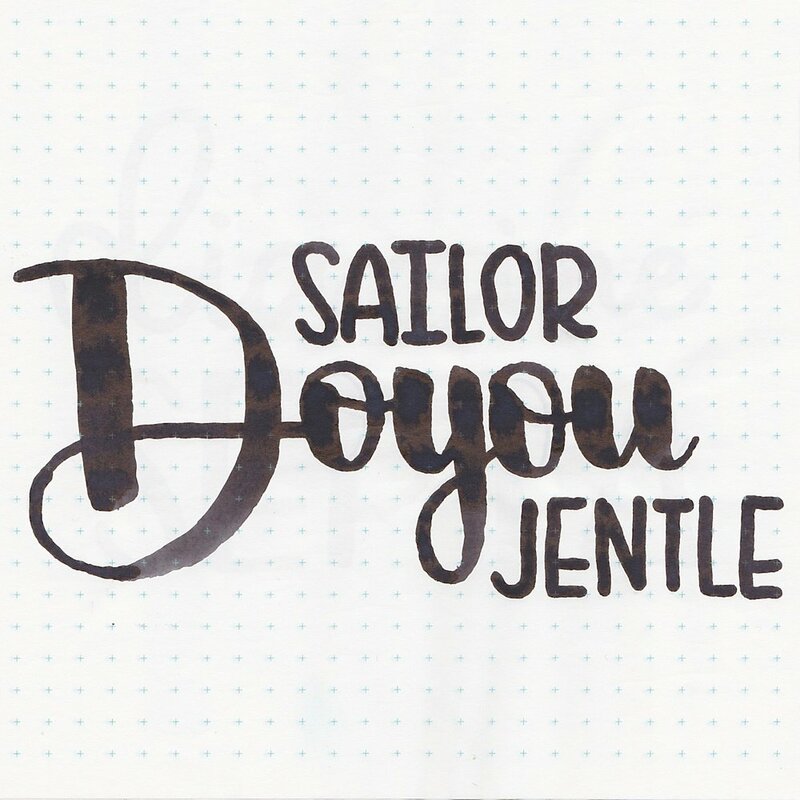 Click here to see the Sailor Jentle inks together. I think both Deep Dark Brown and Macassar a lot lighter and warmer than Doyou. Diamine Espresso, Pilot Iroshizuku Yama-guri, and Pelikan Edelstein Smoky Quartz. Click here to see the brown inks together. This is a pretty wet ink, which I love. I enjoy wet inks that have a nice flow. I started out with a Conklin Duragraph (with a broad Goulet nib) and then switched to the Edison Nouveau Premier Seaglass with a medium nib. 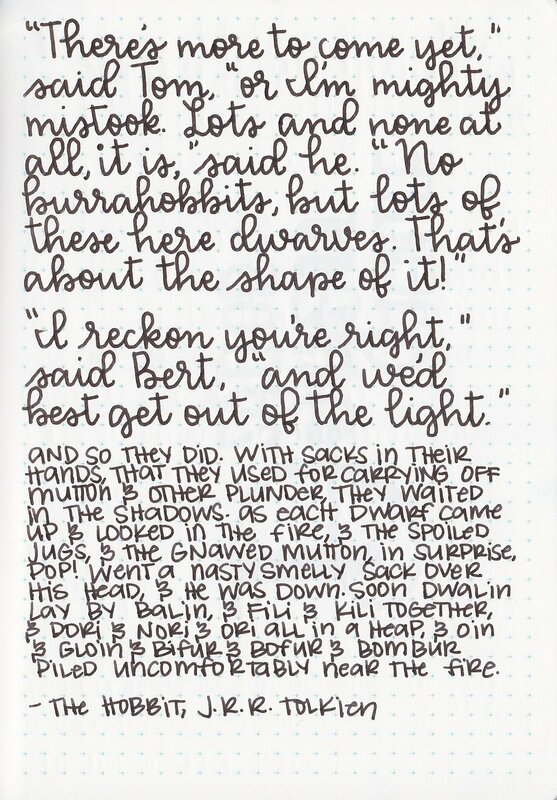 I couldn't believe how wet it was in the broad nib-it almost felt like I was writing with a marker. Overall, it has a nice dry time, and a nice wet flow. There isn't anything bad about this ink, the color is just a bit dark for me. In the broad nib it just looked black to me, not brown.